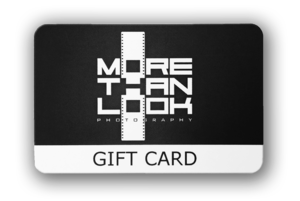 A More Than Look Photography Gift Card will make the perfect gift for any occasion. Our Gift Cards can be redeemed against any of our products (i.e. additional prints, canvases, etc.) or sessions. Your gift card will be presented in a complimentary greetings card with the option to have your personal gift message printed inside. We can post the gift card directly to the recipient, making this a very unique, personal and hassle free gift! Please make your selections and leave any gift message in the ‘Instructions for Photographer’ box on the checkout page. Payment can be made by credit/debit card via PayPal, or bank transfer. If you wish to pay by bank transfer please follow the phone payment option (although we do not take payment over the phone – we will send you an email with payment instructions). Your gift card will be shipped to you or ready for collection from our studio within 5 working days after completing your order.